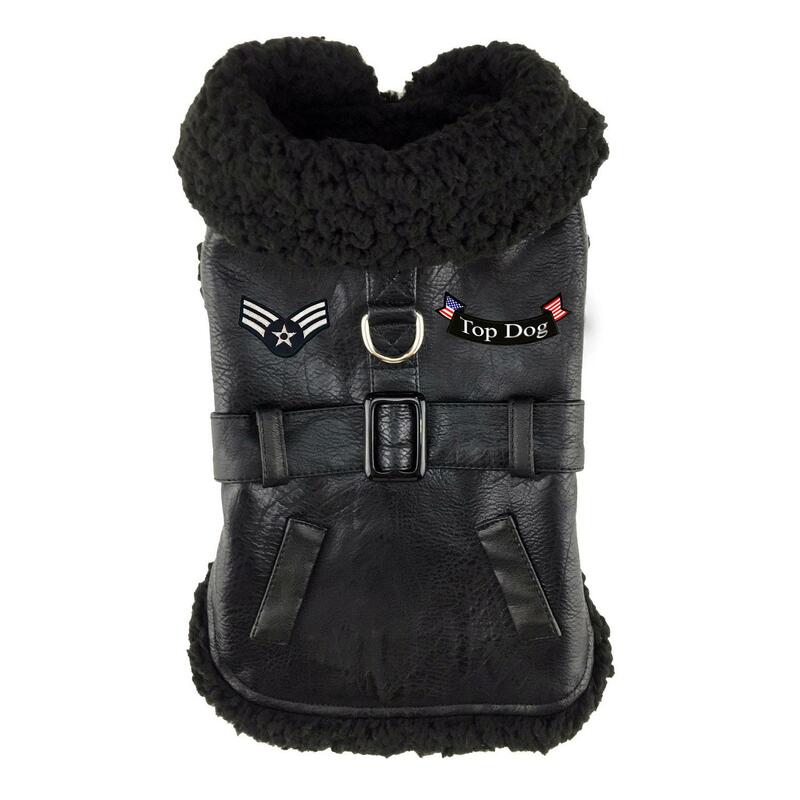 Give your pup an elegant bomber style harness coat with Doggie Design's Top Dog Flight Coat in Black. 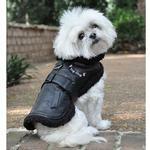 Doggie Design has updated their popular bomber coat with this elegant Top Dog Flight Coat in black. 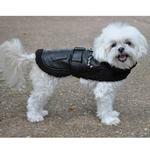 Let your dog be your co-pilot with this luxury dog jacket that doubles as a harness. 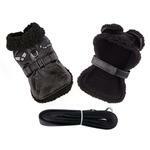 This belted dog coat is crafted in luxury vegan leather and faux sherpa trim and includes a matching leash. The inside is lined with a faux sherpa material for an ultra-soft feel. 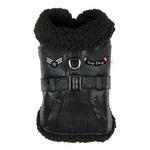 Touch fastener provides adjustable closure at the neck and belt. Custom embroidered patches add an authentic feel to this flight coat. Ideal for a stroll through the air park or for any other wingman activities. 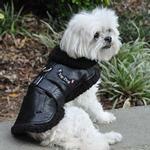 Top Dog Flight Harness Coat by Doggie Design - Black Customer Photos - Send us your photo! My dog Chino loves this jacket and so do I. He is a 63lb pit, has a 26" chest, 21 inch neck and is about a 22 inch in length. I got a size 2x and the fit is perfect. The fleece is throughout the inside and it has Velcro for the neck and belly. The outer part looks like real leather. I totally love this jacket and highly recommend it! was not satisfied with product (rashguard-neck stretched out on product making it unwearable). Return policy states no hair on garment, which is hard to do since in order to see if product fits, must try on pup. Did contact BaxterBoo who promptly responded and advised to take roller to product to remove hair and to provide the tags. BaxterBoo seemed concerned about my experience and dissatisfaction of the product quality. Unhappy with the product but satisfied with the effort put forth by BaxterBoo to remedy the situation.